Well, about three weeks before Memorial Day, we decided to take a last minute trip to Quebec City for Memorial Day weekend. 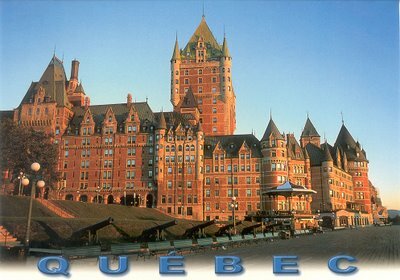 We had been to Montreal together quite a few times, but it took me awhile to convince Mr. Bean that we needed to go to Quebec City. I had been once as my high school graduation present (I was planning to major in French in college) and absolutely loved it; so I wanted to go back as an adult for a romantic weekend, 15 years later. So, as for me planning is as much fun as going, I had to get into planner mode quickly. First issue of importance was lodging. I tried Priceline numerous times with no success. I also looked on-line at different lodging in Vieux Quebec itself, both lower and upper towns. The only rooms I could find were over $200 each. Also, Mr. Bean is NOT a fan of B&B’s and doesn’t like older rooms – the “ambience” is not for him – I know, sad, but true. I then decided to try hotwire and see what came up. This was my first foray into the hotwire experience and I admit I was nervous. I used betterbidding.com for assistance to see if I could figure out what the hotel was. Based upon the information, I knew it would be either the Hilton Quebec or the Delta Quebec. I had stayed at the Delta in Montreal numerous times with great success, so I hoped I would be so lucky for $92 a night, we were staying three nights. Took the risk and got the Hilton. I was a little nervous about it as it was outside the wall of Vieux Quebec and there were mixed reviews on tripadviser and other places. But I looked at in on-line and it seemed nice. Traveling was easy. We knew we were driving. We live in upstate NY so the directions to the hotel said it would be about 5 and ½ hours. Then I had to plan the two full days and ½ day before we came home on Monday. Luckily, and easily as I didn’t have as much time as I usually do, I was able to find two walking tours on line, with accompanying maps, from www.frommers.com. One tour was for upper town and one for lower town. I decided for Monday we would go to the nearby waterfalls before we headed back home. Then I had to decide meals. 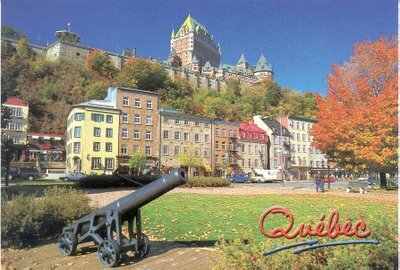 I decided we would go to Aux Anciens Canadiens for lunch one day in upper town, L’Echaude for lunch in lower town, To L’Astral at the Loew’s hotel for dinner because of the view and the other dinner night would be Le Saint Amour. Then the week before, I continually checked weather.com and it said not only would it be raining the whole weekend, but to expect thunderstorms – oh well, time to bring the umbrellas. That Friday, I only had to work a ½ day, so Mr. Bean and I were off about 2 p.m. for the drive up. And of course it rained the whole way. 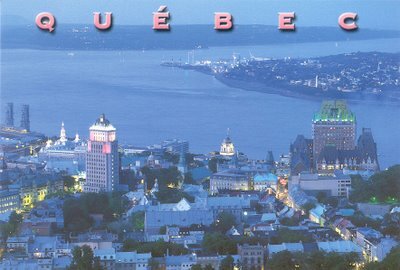 It only took about 15 minutes to get through the border and we were in Quebec city by 8 p.m., even going through the rush hour of Montreal. It was a really nice ride. The appearance of things really seem to change once you cross the border. Also, we have a Toyota Scion XB and I don’t think Canadiens have ever seen one before. EVERY single time a car drove pass us, both the driver and all passengers would turn around and just stare at our car. It got to the point where Mr. Bean and I felt like celebrities so we started to wave at everyone. We had a good laugh! We then arrived at the Hilton which is about 23 stories – which for Quebec City is a skyscraper. The only other really tall buildings were the Delta and the Loew’s. I had called the day before for a NS, king-size bedroom with a view of Vieux Quebec. They said they would put it in my requests, but couldn’t promise anything because the hotel was booked solid. And because of the rate I had, I wasn’t expecting anything either. So we valeted our car (seemed to be the only option at the time and was $20.65 CAN a day) and went to the room – 907. So I walked into the room – and it was AMAZING!!!! We had an end room with a gorgeous view of Vieux Quebec, including Chateau Frontenac, the Seminary, Notre Dame, the river, the walls around the city, etc. and the parks were just below our window. We got to the room just in time to see the sun set and the lights on the Chateau go up. It was funny too, because Mr. Bean asked me on the way up why we didn’t stay at the Chateau Frontenac and I said (1) I didn’t want to pay more than $300 a night for a room; and (2) I was afraid the rooms would not be as nice for that kind of money. So when we saw this view, I told him that it was a good thing we stayed at the Hilton because the view from the Chateau would have been of the Hilton. We had a much nicer view as I would rather be looking at the Chateau as opposed to from it. And I loved laying in bed going to sleep, leaving the curtains open to see the Chateau. And the room itself was great too. We were on a NS floor. We got a KS bed which was VERY comfortable and the room was big enough for also a desk and chair, and two comfortable chairs with a table. The bathroom was all black and white marble and spacious as well. We were exhausted that night so we ordered room service. I know, I know, why not go out for dinner? Well, one of Mr. Bean’s fave things to do is order room service. He says it makes him feel like he’s really on vacation. I’m not as much for it, but I promised so we did. And I can honestly say it was the best room service meal I had ever had and it was REALLY good. They had a plan for $10 more than the entrée price, they would also give you an appetizer, dessert and coffee so that’s what we did. I had a fish soup in a creamy tomato broth, duck with blueberries and crème brulee. All I can say is YUM!!! It all came piping hot, tasted great. The duck came with lovely vegetables of peppers, green beans (fresh) and broccoli, and a potato au gratin – I ate every bite. And the crème brulee was to die for – and they had lovely fresh fruit of strawberries, blueberries and raspberries on top – delish. Mr. Bean had a salad, filet mignon with foie gras and truffles and the crème brulee. He loved his as well. It came to about $80 CAN. Absolutely delicious. After dinner, we did our favorite nighttime activity when in a foreign country. We watched TV. I know, I can hear you saying WHAT THE %$&* WERE YOU THINKING?!?!?!?!? But please let me explain. We love foreign television, especially the game shows and variety shows. We just don’t have the same thing here in the good ol’ US of A. We love the game show hosts who yell at the contestants for their stupid mistakes, we love the crazy antics of the hosts, we love the dancing girls and the loud crazy music, we just love it all. And there is nothing like it here. So every night, after walking miles upon miles when touring, we have done that in Italy, England, France, Greece, Switzerland and now Canada. And we will continue to do it. We love it and are addicted. So there. Saturday morning, I woke up about 8 am to see that it was very cloudy. Mr. Bean got up about 9 am and we decided to go see the Parliament first. Mr. Bean works in the Legislature so he is interested in all things government. We went to the concierge to find out how to get to the starting point of the Upper Town tour walk. We found out we were right next door to the Parliament – so that was a quick walk. As a result, we started in the middle of the “tour” but it was easy to do with the directions we had. Mr. Bean was disappointed that there was scaffolding all over the tower of the Parliament – that always seems to be our curse. Whenever we see something for the first time, it usually has scaffolding on it – the Washington Monument, the Pantheon, you name it, we have seen it with scaffolding. We call it “The Curse of the Scaffold”. Yes, we know it needs to be done, but doesn’t mean we like to look at it! Also, because it was Saturday, there were no tours which left Mr. Bean disappointed but something to look forward to the next time. 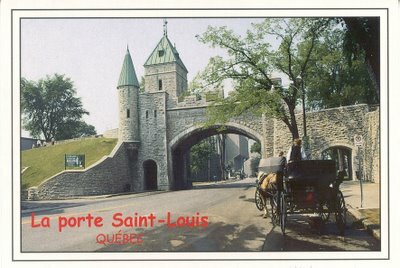 We then walked down and went under the arch of the fortress walls at the entrance for Rue St. Louis and into Vieux Quebec for the first time. Once you cross below that arch, it feels like you have transported yourself back in time from the present to the early 1800’s. It feels so magical and so European. We immediately turned right and walked up to the Citadel which was up a steep incline. Now one thing to know about Quebec is that it is NOT a flat walk. It is literally built into a cliff, hence the Upper Town and Lower Town. But even within each level of the town, it is VERY hilly. So wear VERY good walking shoes and be prepared to walk a lot and on an incline. My legs, especially my calves, got a good work out. So we walk up go through the first entrance of the Citadel and then are stopped. We find out that we have to take a tour as the Citadel is a working facility. And that it’s an hour long. Well, Mr. Bean was having NONE of that – he all of a sudden became Mr. Grump. “I’m Hungry”. Okay, what do you want to do about it? “You said you were going to bring up croissants to the hotel room for breakfast and you didn’t”. Well, you told me not to as we would find something on our walk. “Well, I didn’t know it was going to take this long”. You mean the 30 minutes we have been outside? And this is from a man who NEVER eats breakfast in real life and a lot of times doesn’t eat lunch. And last night we didn’t finish eating until after ten p.m when we usually eat diner about six p.m. “Well, I’m hungry today and I don’t want to wait an hour”. Alrighty then, we’re off to find food! So we walked back down the incline, turned right and continued down Rue St. Louis – do we want Restaurant Parmesan? Not open. Restaurant L’Omelette? Too commercial. As we were walking, he became grumpier and grumpier – “where are the bakeries? Where are the pastry shops? I want a croissant!” Yikes – time to get some sugar in Mr. Hyper-glaucemic (sp?) And then we found our breakfast food mecca . . . a creperie right in between Maison Maillou and Chateau Frontenac. It was Le Petit Chateau Creperie. And this was when we had our gastronomic paradise of food. Two café au laits, two Francoises (crepe with apples and fromage) an orange juice and a pineapple juice for $33 CAN. And it was worth every penny. And I ate every morsel of deliciousness. It was heaven on a plate. Why can’t we have crepes here? I am not a breakfast person, but if this was a choice, I soon would be. YUM is the way to describe it. But, one downfall. This was the time Mr. Bean decided to tease me about my French because the waitress kept correcting my pronunciation of words. You see, I was a French major in college, lived in Toulon, France for six months in order to get my degree and studied it for eight years. But there are several problems with this. First, I speak French with a southern accent. Which is VERY bizarre because I don’t speak American with a southern accent. I was born in upstate NY with very Northeastern parents so I never had an accent. We moved south and then I grew up there. So, all of my French “learnin’” came from teachers and professors who were distinctly southerners. I first learned of this problem when I lived in France and not only were the French people having some difficulties, but all of the other American students who were from the Midwest enlightened me as to this twist of French language fate. So, yes, I am an American who does not have a southern accent unless I speak French. Go figure. Second, I learned Parisian French, not Canadian French. So there are some differences that can make things difficult. My origins are actually French Canadian. My grandparents on my dad’s side spoke French and my dad’s first language was French (of which he remembers absolutely nothing – how sad is that?) So my grandmother (memere to me) and I would argue over the spelling, etc. of French words. Third, since I graduated from college in 1994, I have had the need to speak French probably only about 6 or 7 times. And I have been out of school, learning French, for 12 years, 4 more years than I studied French as a whole. So yes, I am VERY rusty. So add those things in and it can make for fun times. I can speak it fine (with the accent of course), read it fine but listening is a bit tough, I admit. So my lovely Mr. Bean, who speaks not a lick of French, loved to see my difficulties and teased me relentlessly. Nice of him, don’t you think? Anyway, sufficiently fortified by an amazing petit dejeuner (breakfast), Mr. Bean was up for learning some history again – he’s the history buff of the two. And during breakfast, it became a gloriously beautiful, blue sky, sunny day which it stayed for the remainder of our trip. I think this is due to my magic umbrellas – they are two –a small handbag sized umbrella and a large one that has the Sunday comics on it which we got free when we ordered delivery of the Sunday paper. Whenever I hear it’s going to rain, I bring these two trusty magical items with me and it never rains – I have had great success with it and no failures, just like on this trip. Upon leaving the creperie, we turned right and first looked into the Chateau Frontenac, which is owned by Fairmont. Although pretty on the inside, we thought the Fairmont Copley Plaza in Boston, where we stayed on a trip in March, was much nicer. So it just confirmed our happiness with the Hilton. We next went onto the Terasse Dufferin which is an amazing boardwalk outside the Chateau right on the end of the cliff. They are actually doing a lot of archeological work on the cliff, trying to find an old fort, but it is still pretty. It had an amazing view. We sat out there awhile, just drinking in the sites. You can just imagine back in the 1800’s, people walking on this wooden boardwalk, with parasols and long dresses for the women and top hats and canes for the men. In the present, however, we have shorts, capris, baseball hats and cameras. We loved watching all of the dogs until we noticed they were walking funny. We realized upon touching the wooden boardwalk that it was VERY hot and these poor pets were having to put their poor paws onto the hot wood while the owners, in shoes were oblivious. The Promenade Des Gouverneurs, which is a staircase leading up the cliff from the Terrasse to the Citadel was closed at it just closed on May 1 and will be closed until November because they are updating it. Darn, I don’t get to walk up a ton of steps. We then continued our walk through the Jardin des Gouverneurs, which used to have the Governeur’s maison which burnt to the ground, the Place D’Armes, and then over to the Basilique-Cathédrale Notre-Dame, the main catholic church in Upper Town. Although pretty, it was not one of my favorites. We also checked out the Seminary. We then went up my favorite street – Rue du Tresor which is simply an amazing alley way which artists have overtaken with their wares for sale. All of it was beautiful, but my favorite pieces were alas too rich for my blood. One piece I really wanted which was of Quebec in the abstract (in oil), the artist wanted $475 – it was about 16” by 24”. Another artist wanted $80 for an 8” by 12” oil painting. I asked how much for 2 and he said $150 which didn’t seem like much of a discount. I’m sure the paintings were worth every penny, but we just didn’t want to spend that much. Now, I’m sure you were wondering my I call Mr. Bean – “the pamphlet guy”. Well, as you can tell above, I am an extreme travel planner. I have folders, guides, plans, maps, calendars, schedules, etc. I have it all. And although Mr. Bean enjoys it, he sometimes likes things more spontaneous. And one way he imposes this on me is through his pamphlet, shall we say “fetish”. He loves pamphlets. Whenever we travel anywhere, the first thing he heads to in a hotel is their pamphlet rack – you know the one. The one where each pamphlet or brochure says THEIR place is the most amazing place to go to and for only $$$ here, you should come too. And Mr. Bean picks up about 50 of them and swears that, if it’s in a pamphlet, we need to go to it. So then I spend the next few hours in the hotel explaining that none of the real tour guides such as Fodors have ever mentioned this place before so I don’t think we should go. But then I get worn down and succumb to one of them. And then the “pamphlet” place is always a bust – but I must admit good for a story. For example, the only time we’ve been to London was in March 2004. We had only three days in London; and as I know you are aware, we had a ton of sightseeing to do. And I had the perfect schedule to do it in. Well, Mr. Bean found a pamphlet for a museum which had just opened which depicted all the murders and horrific things of London like Jack the Ripper, etc. Well, after being stuck in this tour for more than three hours (of which I was going insane), Mr. Bean was repaid by only getting to see the Westminster Abbey (he loves graves and tombstones) for about 30 minutes because we got there just before closing time. Then, in Boston this past March, he found a pamphlet for a Star Wars exhibit at the Boston Science Museum. As he is a Star Wars Fanatic, he begged to go. It was his birthday trip; so of course I said yes. Needless to say, although he liked the exhibit, he hated the museum as it was too crowded and too many noisy kids. So, we are now upon the point of the Quebec pamphlet story – we had such an episode here. The night before, he found a pamphlet for “Quebec Extraodinaire” – a 3-D movie off of Rue du Tresor which would explain the entire history of Quebec. When we bypassed the site when we were on the Rue du Tresor, he wanted to go. As the movie was only 30 minutes, I said okay. So now I have another pamphlet story. For only $15 CAN, the two of us got to see a “3D” movie that wasn’t really 3D. When the movie started (in the very deep movie voice) “Since the beginning of time . . . “, we knew were in for a fun ride. And the special effects were in fact, not very special. They had a waterfall upon which they showed some of the movie. And they kept using it over and over and over again because it really was the only special effect they had. There was also a face that they would make into someone speaking and there was a falling bridge (which made me laugh in a very quiet theatre which was supposed to be a very somber part of the movie - sorry to the other patrons), but other than that, not much. So save your $15 and have a couple of café au laits somewhere. And Mr. Bean admitted that, once again, his pamphlet didn’t work out the way he wanted it to; but we still liked it because it made us laugh. After the lovely movie, we decided we were hungry. 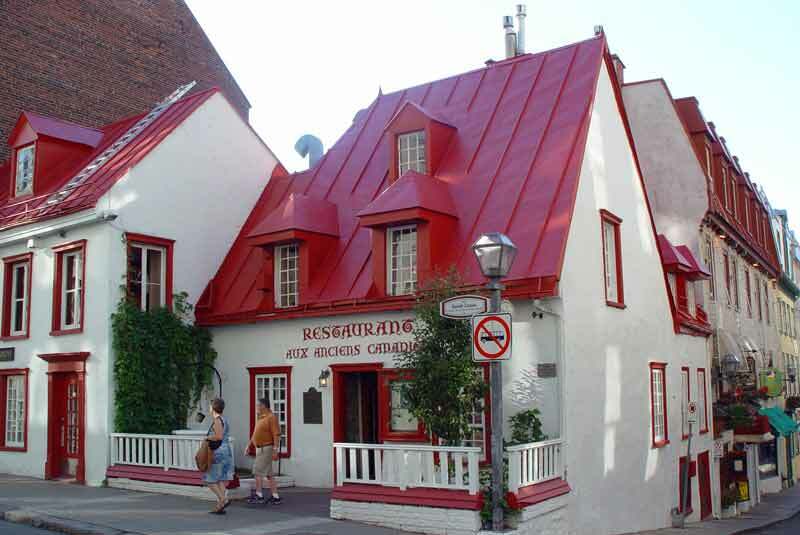 So off we went to my favorite meal of the trip – Aux Anciens Canadiens. It is in a historic home called Maison Jacquet, built in 1677, at 34 rue St-Louis. All the tour guides recommended this place and it was amazing. For lunch, they have a fix prixe for $14.95 CAN, you get soup, entrée, dessert and a glass of wine or beer. For our appetizer, as I don’t like leek soup, I upgraded for an additional $4.50 for French onion soup – YUMMY! Mr. Bean upgraded for $4.50 for escargot – delish. The bread was homemade and very good. We both picked the St. Jacque pie with beef, pork and caribou – absolutely amazing. I’m not usually a meat pie person, but this was a slice of heaven with a slight sweet taste that complimented the meat. The crust was light and not like any crust I had ever tasted. It came with what they called “ketchup” but was really a fruit compote which was also amazing. I also had this stringy vegetable that tasted like a cross between spaghetti squash and sauerkraut. I asked what it was and was shocked to learn it was turnips and honey. I normally hate turnips, but I really liked this. For dessert, we both had the maple sugar pie with cream which was the most heavenly thing I have ever put in my mouth. We decided it was similar to what pecan pie would taste like without the pecans and I have now decided that pecans were worthless! The meal, with two nonalcoholic ciders and a café au lait came to approximately $60 CAN - very much worth it. One interesting thing about this place to know is that they don’t allow you to take leftovers with you. I meant to ask why but forgot. So if anyone else goes, please ask because I’m dying to know the reasoning! We enjoyed the meal so much that I bought the cookbook, which was signed by the chef of the restaurant ($10). I have decided that the maple sugar pie will be my signature dessert at holidays, etc. so I was very excited. I was saddened to see that the St. Jacques pie was not in the menu, so they immediately printed up a copy for me, along with a recipe for the ketchup. I found out the ingredient that made the pie sweet was cinnamon which was great for the meat. I can’t wait to try the recipes at home. I also bought a lithograph of the restaurant ($5) which I’m going to frame for my French country kitchen at home. The meal was unbelievable, the service impeccable I would recommend this place to anyone! After being sufficiently fortified, we continued on our tour and literally went just around the corner onto Rue des Jardins for a two second walk to the Chapelle/Musée des Ursulines, a chapel for the still running monastery of the Ursuline nuns. Whether or not you have certain opinions about the catholic church, this place shows an amazing history of the influence of these nuns upon the native Canadians. The Chapel was very pretty and interesting to show how they divide the section for the nuns by iron bars from the rest of the population during services. Also, the museum, which is $6 pp, was interesting to show the history. It is a three story building showing how the nuns influenced Quebec. We next went further down the Rue des Jardins for another two seconds to the only Anglican church called the Anglican Cathedral of the Holy Trinity which was built in 1804. We thought this was the prettiest church of the four we visited that weekend. And it was funny to see English as the primary language everywhere instead of the French we saw everywhere else. We continued down the Rue des Jardins and saw the Town Hall and then continued to walk on Rue St. Jean, to check out the stores. It was a VERY busy street with a lot to see people wise and some very interesting stores. There were also regular clothes stores, etc. that you would see in NYC. All in all an interesting street. We walked this street all the way back to the fortress wall. On the way, at the very end was what appeared to be a Caberet with a huge circular lit up sign. It kind of reminded me of the Moulin Rouge in Montmartre in Paris. It was another busy area of Rue St. Jean. We also passed an area where there appeared to be a skateboarders park with a ton of skateboarders and then bleachers where a lot of people were just watching them. Very interesting. Once we walked out of the fortress walls, we continued on Rue St. Jean for about two blocks until we reached the convention center/mall of Quebec which is partially at 880 Rue St. Jean. So instead of walking up the hill to our hotel, we were able to ride up three or four levels of escalators as the Hilton (and the Delta for those who stay there) are connected to the convention center. Also in this mall is a great ATM at the Banque de Scotia which we could use our bank card and were not charged extra for taking out money. I must admit the escalator rides were a MUCH needed respite from the all day walking as my legs and feet were sore. We went out that day at about 9-9:30 a.m. and were returning to the hotel about 3:30-4 p.m. So, including two meals, we toured about 6-7 hours which was at a leisurely pace. Not too shabby. And the town was not crowded at all so it was very relaxing. We then decided to refresh ourselves at the Hilton pool. This pool is open year round as it is heated and has a section where you can get into the pool inside and then swim under a glass wall to get outside. I was happy about this because our Memorial Weekends up north are usually chillier. Well, not this year. After walking around in about 80 degree, sunny weather, we were ready for a swim. And the Hilton has probably one of the nicer hotel pools I’ve seen. It is on the third floor and has a wonderful view of Vieux Quebec. It was very clean and we enjoyed it immensely. The only “issue” involved a large group of students who were obviously there on a school trip – there actually appeared to be a lot of them. Kids were just being kids so we didn’t really have a problem but some people might as they were excited and a bit noisy. The pool was wonderful though (I’m beginning to feel like an advertisement for Hilton). After the refreshing swim in the pool, we decided we were once again hungry and wanted to find a place to eat. We went back down the escalators to Rue St. Jean and decided to take a left away from Vieux Quebec instead of a right. What a great street! Lots of cute stores and ethnic restaurants (and a vegetarian restaurant as well) and we found the bakeries! In just the few blocks we walked, we found three bakeries. So that’s where the croissants, pain au chocolates and French bread were! We vowed to return on Monday to take supplies home. Along the way, we found a cemetery on Rue St. Jean right next to a small stone church, the name of which I cannot remember. As Mr. Bean loves looking at the history of cemeteries and their tombstones, I told him to look around while I pulled up a park bench and people watched. Well, our first sign that this cemetery was going to be interesting was the fact that it was open until 23 h, i.e. 11 p.m. What cemetery is open that late and what good can come of it after dark? We were there about 7 p.m . and it was still very sunny out. As I was sitting there, I saw not one, but two different men, who appeared appropriately dressed, walk in from the street go up against the church and pee against it. Does this mean they are going to heck? They then returned to the street and were on their merry way. I was shocked but could not stop myself from laughing. I promised myself that if a third did the same, I was taking a picture no matter what. Unfortunately (or fortunately, who knows) no such third person arrived. Also, there were couples, I kid you not, using sarcophaguses as beds and making out on them. Then, Mr. Bean returned and said he saw a number of condoms. Just lovely. Plus you could smell alcohol everywhere. I really feel sorry for this church and cemetery, both of which were very old. The church was really pretty. Needless to say, it is not someplace I would want to be at night. We didn’t see any restaurants that we wanted so we decided to walk back down Rue St. Jean into the walled old city. Boy had it gotten busy since we were there last. You could definitely tell it was Saturday night in lovely summer weather. It was really fun to people watch. And we love seeing all of the dogs. They were so cute and well behaved! We could never bring our Jefferson out like that as she would get way too excited. We also did a bit of shopping. Mr. Bean was excited because he was able to get a jersey and baseball cap with the old Quebec NHL hockey team logo on it. I must admit I thought it was cute too – but don’t tell him that or he’ll never wear it. I love the fleur de lys that represents Quebec. As you may recall, we originally had plans for our two dinners but we decided we didn’t want to get all dressed up and just wanted to wing it instead. So that is what we did. After a couple of places being too packed, we found the perfect outdoor place to eat: REST FRERES DE LA COTE. It was a great little restaurant right on Rue St. Jean, where the street curves to the right and up the hill, near the St. Patrick’s Pub. Once we sat down outside, we heard a lady behind me tell another person that she is from Montreal and every time she comes to Quebec, she eats at this bistro, she loves it so much. So that made Mr. Bean and I very happy. This bistro also had a prix fixed menu so for $19.95 CAN, I could get an appetizer, entrée, dessert and café or tea. I liked the choices so I ordered it, having foie gras pate for the entrée, lamb, provencale style for the entrée and chocolate cake for dessert. I also had an alcoholic cidre. The pate was delicious with a little salad and the red onion sauce, on lovely French bread. The lamb was a HUGE amount, in slices that were tender and in a nice gravy. And once again, lovely sides – the cooked vegetables of fresh green beans, red and green peppers, broccoli and cauliflower made me eat it right up. I actually ate that first which I never do – if we cooked vegetables this way at home, I would eat them all of the time. It also came with a lovely potato au gratin. The chocolate cake was also delicious, very moist with an almost pudding like texture. Mr. Bean did not see anything on the prix fixe menu he liked so he ordered proscuitto with melon for an appetizer. I swear they gave him almost a pound of proscuitto and a ½ of melon. For his entrée, he ordered steak frites which he had been wanting since before we got to Quebec. For a man who loves his A1 sauce here in the states, he used none there. Also, he loved his fries, which in the states he never eats. He shared my cake with me. The meal came to about $65 with tip. We will also return to this yummy bistro. The only complaint I can make about the bistro was that there were too many tables on the small outdoor terrace so we were scrunched together. Because of this, my legs were really bent and the waiter had trouble getting around the tables. So when it was time to leave, my legs, between the huge amount of walking and being bent so much at the table, they REALLY cramped up. I really didn’t think I was going to make it back to the hotel. Slowly but surely we did. And on the way, the Quebec Fire Department was having a show of old (antique) and new fire trucks which of course Mr. Bean, the man that he is, enjoyed immensely. And I enjoyed looking at the firemen themselves who kept up the fireman image quite nicely, if I do say so myself! Once back in the room, we watched more French Canadian telly and had a wonderful sleep. I woke up once again about 7 am for another gorgeous and sunny day. Wow, I love our view! I enjoyed the view and a good book while Mr. Bean slept until about 9:30 a.m. Today was lower town day! I grabbed my Walking Tour 2, with map, that I got from the internet, and we were off! Yesterday, we had decided to start the day at the Citadel before going to lower town. This morning, however, Mr. Bean decided he didn’t want to because “nothing happened there” anyway. I didn’t really care as I had seen it before, but I asked if he was positive. As he was, I happily didn’t have to walk up another incline as my legs and feet were still a bit sore from the day before. Instead, we returned to our lovely breakfast spot on Rue St. Jean at Le Petit Chateau Creperie. And once again, not busy at all. We sat outside again, but this time under the awning as opposed to right out in the sun as we were both a bit red from the day before. During our entire meal we got to hear the amazing church bells from each of the churches in the area. I don’t think they stopped once during out entire meal. There’s nothing like a good breakfast in beautiful weather with glorious background music. I did have trouble deciding what to eat. I absolutely loved what I had the day before; however, I felt weird ordering the same thing again as I felt I should try something new. I then decided that I didn’t care if I ate the same thing the day before because who knew when I would eat it again? Mr. RF felt the same way so two Francoises (crepe with apple and fromage), two café au laits, a jus d’orange and jus d’ananas (pineapple) later and $33 later, we were off to see the lower town. Instead of walking down the steps (which is free), we decided to take the Funiculaire, which essentially is a glass box which takes passengers up and down the cliff for $1.50 pp each way. It’s located right at the end of Rue St. Jean on the Terrasse Dufferine. What shocked us upon reaching the Terrase, however, was the HUGE cruise ship docked at the port. I had no idea that cruise ships went here. Where do they start and where do they go? Definitely something Mr. Bean and I are interested in looking into. It was funny though because with the amazing weather, the “europeaness” of the town and then seeing the cruise ship, we really felt like we were more on a Caribbean island like St. Maarten or St. Thomas instead of being up north in Canada. Who would of thought that we would have August type weather in May? Anyway, the funiculaire was not busy this day and we got right on, but I can’t imagine how long it would take to get on in the middle of the summer as it only takes about 10 people per trip (there are two). It’s about a 5 minute trip each way. I enjoyed it but I don’t think I would like it if it was too packed as it was stuffy. Once down below, we were immediately amazed by the quaintness and beauty of the area. As you walk out of the Maison Louis Jolliet, which was built in 1683 and now is also the building which houses the funiculaire, looking immediately to your right is Rue du Petit-Champlain, the oldest street in North America, and is now pedestrian only with shops, restaurants and of course the cliff. It’s amazing and you really feel transported back in time. I can only imagine how pretty it must look in the winter with snow and Christmas decorations. We meandered down the street, looking in the many art galleries, jewelry stores and souvenirs shops, of course. I’m still mad at myself for not buying that necklace I really liked or anything from the shop that had all sorts of kitchen trinkets which looked like they were from Provence, France. We continued down the street and basically made almost a U-turn to walk down boulevard Champlain which unfortunately is a main street upon which cars are allowed to drive so you are thrust back into reality. There are also souvenir stores there as well as cafes. We walked down that street until Maison Chevalier, which was built in 1752, and through the years, went from the home of merchant Jean-Baptiste Chevalier, to an inn, to a market, to a coffee shop, etc. This was a free museum (they take donations but don’t push it on you) which was two levels and showed us how the building changed over the years and how the Quebecois lived. I really enjoyed it. After checking out the museum, we left the busy boulevard and walked up the stoned rue Notre-Dame (back to pedestrian only streets) to rue Sous-le-Fort, turned right, and walked to the Royal Battery which was built in 1691. Although it was neat to see all of the cannons, the real excitement was when you turned around to look back up the street and VOILA! There was an absolutely amazing view (and wonderful photo moment) of the old street, the cliff and Chateau Frontenac. I took many photos there and may even frame one if they turn out as good as I think they will. After spending several moments enjoying the jaw dropping view, we returned back up the rue and took a right on rue Notre-Dame to go to Place Royale, which was the town’s marketplace. In this square was the Eglise Notre-Dame-des-Victoires, which was built in 1688 and restored in 1763 after a siege. We couldn’t go in at this time as they were getting ready to start mass. We then started walking towards the Musee de Civilization. It was a very modern museum which cost $8 pp adult. The first exhibit was on Indonesia, which was a weird coincidence because we had no clue about the earthquake until after we got back in the room that night. Although interesting, we really wanted to move on to the Quebec exhibits since that’s where we were. So we went into the room called “The People of Quebec, Then and Now” , which had a history of Quebec. It was a great interactive exhibit with movies, audio, things for the kids to touch. Really nice and enjoyable for kids and adults alike. At this time, there are also two new exhibits: “Quebec Cinema, The Whole Story” and “Movie Studio”. Quebec Cinema discussed the history of film in Quebec – we even received free audio guides where, when you stood in a certain spot, the audio came on itself. I love tv and movies, so I found it interesting even though I didn’t know the films. And I saw two Oscars in real life – something I found fascinating. One thing of note – watch out for kids here, because they also show movies and they had no problem showing pieces of movies where the women were barebreasted and enjoying themselves, if you know what I mean. Just a warning for parents. The Movie Studio part was just weird. When you first entered, it was neat because you walked through an area with a green screen so you could see yourself with a variety of movie backgrounds. We had fun with that. Once you got in, however, we just didn’t get it. They had some props and costumes from what appeared to be recent movies; but they also were showing a film which a group of people seemed enthralled in, but we only saw lines and fuzz on it, like the movie was blank – we were wondering if it was showing subliminal messages or something. We also tried to get into “Autopsy of a Murder” which let you figure out clues to solve a murder. It looked very interesting, but at that moment a huge group of boy scouts came in so we decided to move on. We were there about 2 hours and felt we hadn’t even scratched the surface. It is a great place and would be a ton of fun on a rainy day, but it was so beautiful out, we decided to go outside. We then walked to the port where there were a ton of bikers, joggers, sight seers, picnickers, etc. And boy was the sun hot! We walked there a bit but this area seems to be the part that could have been thought up a little better. There were a lot of factories, etc. that just kind of made it look ugly. Once we were done there, we decided we were starving. We went back to the pedestrian part and went on rue Sault-au-Matelot, near rue St-Paul because I really wanted to try L’Echaude which had been named the best bistro to eat at by several guides. Well, we got there at 1:30 p.m. and they said the kitchen was closed. How could the kitchen be closed at 1:30 pm on a Sunday and a gorgeous day at that? I was really annoyed and it didn’t seem like good business sense either as there were a ton of people out. So starving, we walked past the Place Royale, took a quick peek into Eglise Notre-Dame-des-Victoires - but we were on a mission people! Found a GREAT place called BISTRO SOUS-LE FORT which was right on rue Sous-le-Fort (big surprise there). We sat outside and with my view, I could see the cliff, funiculaire and Chateau Frontenac. We also had a very nice waitress. Once again, hubby and I ordered the same thing, which is VERY weird for us. We usually order totally different things from each other, but on this trip, we ordered the same thing 4 times. Here, we each had the Parisienne baguette which considered of duck, shredded like BBQ (but without the sauce) with fromage, lettuce, tomato and the hottest mustard known to man. This came with yummy fries (why do canadien fries taste better than American?). We then each had maple syrup pie for dessert. With one café au lait, 2 perriers, and an alcoholic cidre, it was about $59 with tip. After being fortified, we decided it was time to go back to the hotel. Before we did, however, I wanted to buy a tshirt. I found one I liked, but when I was trying to find my size, the shopkeeper (who was in her 60’s) started screaming what do you want, what do you want, and swatted my hand from touching the tshirts. You would have thought I was touching Lladro or diamonds or something. So, I said, nothing now and off we went. So we went back up the funiculaire, walked ALLLLL the way back to the hotel and almost passed out from fatigue of two days of MASSIVE walking. We then got up the strength to change into our swimsuits and use the pool which was really great on our muscles and revived us. Pool was much quieter that day. After a refreshing dip in the pool, we tried to decide what we wanted to do for dinner. We were really tired – do we want to order in? Go back to Vieux Quebec? What? Mr. Bean asked if I wanted to go to the Thai restaurant we saw on Rue St. Jean so off we went. And we are so glad we did! For some reason, the street was blocked off for BLOCKS for some sort of street festival. It was starting to wind down by the time we got there but it was still entertaining to people watch and to look at each venders’ wares. We then went into the Thai restaurant and enjoyed a great meal. I had “peanut butter chicken” and Mr. Bean had curry chicken. Both meals came with soup, two light eggrolls and dessert (he had tapioca pudding and I had flan). The meal was very good and with three sodas (cans) it came to only $34 with tip. The only bad thing about the meal, was during the entrée, I had to use the rest room. I came back and my plate was gone and I hadn’t finished eating. Mr. Bean swore he said several times not to take it, but the waiter totally ignored him. I’m guessing the waiter did not very good English and Mr. Bean only knows oui in French. After the meal, we decided to check out the marche (grocery store). Big mistake. It wasn’t clean enough for Mr. Bean so he refused to bring anything home from it, either pate or cheese (although it was all super wrapped) so I didn’t get to take anything home. That’s the one thing I was really bummed about. We then walked home and slept after watching our lovely French canadien variety show which included Sinatra, The Wiz and more. Mr. Bean asked if he could sleep in this day so I had no problem. What I was worried about, however, is a trend he has on the last day of a trip. Whenever it’s the last day of any trip where we’re driving, as soon as he wakes up, he wants to go. I’m not that way, I would like, if there is something else to see – to see it. And here, I wanted to go to the Montmorency waterfalls (which are supposed to be taller than Niagara Falls) before we left. But I was deathly afraid Mr. Bean, after sleeping late, was going to want to go straight home and miss the falls. He slept until about 9:30 am, and I was happy to find out he stilled wanted to go to the falls before the ride home. So I had directions from Fodors, but I just wanted to make sure they were correct. So I went to the concierge and was shown the highway was not only right outside the hotel, but that it couldn’t be any quicker to get there! It was unbelievable how easy it was to get to the falls. I don’t even think it took 10 minutes and it was all on one road, pretty much. And it was weird, you’re driving on a highway, and all of a sudden on your left is a VERY tall waterfall. Although the falls did appear extremely tall, because it is not as wide as Niagara Falls by a long shot, it just didn’t seem as amazing. Don’t get me wrong, they were beautiful and I’m so glad I saw them, but I give Niagara the win. It was hardly busy there at all – maybe because it was chillier than the past few days and cloudy. The park cost $8 Can to drive into the park. We then were able to buy the cable car tix ($6 Can one way, $8 round trip) and get on right away. Now, if cable cars scare you or you just are a masochist, they do have stairs going up the side of the falls – but let me tell you – they are VERY steep and at one portion get wet from the falls. I’m not a fan of stairs because I’m a klutz – I have fallen both up and down steps many, many times, and sometimes needing emergency room visits from it, so I wasn’t interest. Mr. Bean wanted to walk down them, but I said – no thanks, I don’t need to die today. And because it was chilly, I didn’t need a cold either. But I have to say the cable car was a bit nerve racking. I’ve been in them before, but this one was smaller and seemed to sway a WHOLE lot more. And, there is no employee on them with us – it’s just the tourists. Makes you wonder why there aren’t employees on them. But the cable car was a beautiful view and we got up in record time. At the top, there is Manoir Montmorency, above the falls, which was opened in 1994, and has a restaurant right next to the falls, and a bar and gift store. It was very cute. I could totally see having a wedding reception there. We had a glass of wine and a café au lait at the outside seating area of the bar for $9 Can. The prices for the food were not bad either. It was nice to relax and people watch. While there, we noticed that there is a neighborhood of many houses near the falls. Could you imagine just taking for granted one of the tallest waterfalls because it’s your neighbor? Or being sick and tired of having to show guests to your home the waterfall? After enjoying our beverages, we then walked over the falls which have a bridge over it you can use. That bridge is right over the breaking point of the top of the falls, i.e., where the falls start going over the ledge. Talk about a little scary. Especially once we read the history that the two previous bridges collapsed and over went the tourists. I’m not a big fan of tall bridges anyways but I have to admit the view was pretty. And I was proud of myself because I walked the whole way across the bridge twice. And it was here hubby and I got our first picture of together – pretty sad that we went the whole weekend without a picture together. I have to admit there were two things I thought VERY interesting about the Falls. First, there were no employees guarding the bridge, the falls, whatever. In the U.S., there would have been at least 10 park employees watching the area to make sure that no Yahoos decided to get it into their head to jump into the river or whatever. Nope, here, the Canadian park employees decided we were smart enough to know that it wasn’t a good idea. Second, there was one park employee at the top and right next to the falls – selling alcohol in a little refreshment stand – never a good combination in my mind – alcohol and common sense. Once again, Canada decided we were smart enough to handle it on our own. Thanks Canada, for trusting my instincts. After taking in the beautiful sights, we did the return trip on the cable car and left the park. We were there about 1 ½, 2 hours at most. It was great. We left about noon so we were expecting to get home about 5:30-6 p.m., a perfect amount of time. But it was not to be. Because the border crossing took over 2 hours, we didn’t get home until after 8 p.m. Talk about a long day. And boy were we ticked about the border crossing – the U.S. needs to get it’s act together. They have it so about 20 feet in front of the border, you all of a sudden go from six lanes to 4. And it caused A LOT of problems. We didn’t move for the longest time. We were going stir crazy. And of course, we found out after the fact that if we had taken the last exit in Canada before the main border crossing at the Northway, there was a MUCH smaller border crossing that is little known that we could have used and gotten through – now we know for next time. All in all, an amazing trip and one we can’t wait to do again!